There really isn't a good explanation for me not stopping in to eat at Fat Mike's any sooner than today. It's right next to the Theiss Farm Market in Klein, so I've seen the restaurant many many times. I went to Klein High nearby, and still marvel at the way the area has grown. The HEB we frequent is right there as well, but for whatever reason the mitt just never closed around the ball. Our day job office is up in The Woodland's, so getting over to Fat Mike's for lunch isn't normally in the cards. That's the excuse I am sticking with anyway. Today however, with me dilly dallying around the home office until lunch time, it worked out for a visit. I only wish I had stopped in sooner. What a cool eatery. The place is decorated in warm cozy Texas style digs. It's comfort through and through. The staff is warm and friendly, the portions are Texas gigantic, and the food hits the comfort spot dead on. Their menu is loaded with what they call Texas Comfort Food. Food influenced by Texas traditions with a contemporary flair. Lots of BBQ, burgers, chicken fried this and that, and fresh vegetables out of the adjacent farmers market. They make their own corned beef and that is what sounded good to me today. I was served a massive excellent Rueban with house made chips. Michelle had a 1/2 chicken, fresh veggies and mac & cheese. The chicken was smokey, tender and juicy. One thing that caught my eye and I will have to try soon is their jalapeno stuffed with pulled pork and cheese. I just wasn't up for a hot zinger today. Now that I've learned they have a brunch menu, we'll be stopping in after service from time to time. With that corned beef, their hash is sure to be a winner. 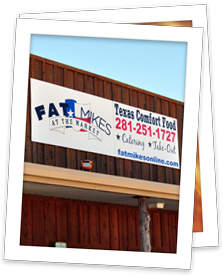 When BBQ and comfort food is calling, we'll be back over at Fat Mike's for sure.